Arena Poole is easily accessible by road and public transport. The Centre is within easy reach of the A35 and the A31, connecting Arena Poole with the surrounding areas of Weymouth, Blandford, Wareham and Dorchester. Poole Trian station is located within 15 minute drive of the Centre, linking the town with major stations at Bournemouth, Weymouth and Southampton Central. 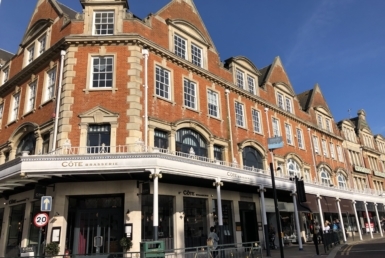 In addition to the on-site café at Arena Poole – which serves hot and cold food from breakfast until early afternoon – nearby Poole Town Centre offers an excellent choice of restaurants, cafes and pubs to suit all tastes. High street retailers, department stores and banking branches can also be found in the Centre of Poole. A Virgin Active gym is within walking distance of the Centre, offering corporate membership schemes. The Premier Inn is within 2 minutes of the Centre, offering overnight accommodation conveniently close to the Centre. Alternatively, Poole Town Centre offers plenty of other accommodation options. Close to Poole Harbour and renowned sandy beaches, Arena Business Centre in Poole provides an excellent range of high quality serviced offices and studios. This thriving Centre is home to a number of high profile companies including Standard Chartered bank. The exceptional working environment offered at the Centre benefits from a lovely on-site café, parking, smart meeting rooms and staffed reception. To help your business start working straight away they offer state of the art IT and telecoms, with office furniture packages. Their on-site team will be there to ensure you have everything to make your business run smoothly from day one; their receptionists will meet your visitors, arrange IT & telecoms, make meeting room bookings and deliver your post.